My grandmother always loved shades of light purple, pink, and beige. Grandma and Grandpa’s house, which I knew very well growing up, displayed those colors, and when Grandma moved to an independent living community her condo reflected those colors as well. When looking for a Christmas present for her one year at the Mountain View Art & Wine festival we saw a booth from a company called Shades of Gold which had glass and gold figurines that contained exactly those colors. We bought her one, and that became our tradition for a number of years. When Grandma had to be moved to a single room in an assisted care facility, my sister-in-law gave Terry and me all those figurines. They stayed in the box for a few years until our kitchen remodel. 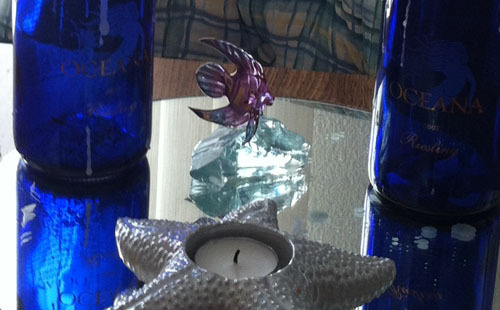 (That remodel, by the way, courtesy of what she left us after we lost her.) One of the intents of the china cabinet we had built was to display those pieces, and they have had a place of honor there ever since. Then, just a few weeks ago, Terry got the idea of taking one of those pieces and putting it on the centerpiece of our dining room table. Brilliant idea, and a great way to remember grandma as we have our dinner. 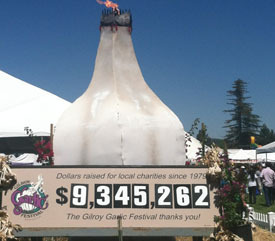 Last Friday we went to the Gilroy Garlic Festival for the first time since our visit the year we moved here, 19 97. 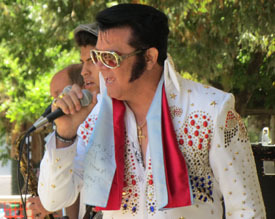 We figured that it was time, and Terry wanted to see Donald “Elvis” of our local Victoria’s restaurant perform at noon. I didn’t have any particular expectations of the day, but it turned out to be a fun and productive time. Don gave a great performance and there was quite a crowd at the stage, particularly given how early in the day the show was. His backup band, the Hound Dogs, were first-rate professionals. It was a lot of fun. Wandering the vendor booths, I found a garlic-themed kitchen apron with more practical pockets than the one I’ve been using. Then I came across a belt pack to replace my old one, which I’ve had since before we moved into the house, if I recall correctly. The nice thing about it is that it holds the same amount of stuff but is much more compact. We of course had to get lunch at Gourmet Alley. Terry had a garlic sausage and I had a marvelous pepper steak sandwich. On our way out we saw a booth for a well-known local solar company. We’ve been thinking about solar for a long time, so we stopped by and ended up setting up an appointment with a sales rep.
All-in-all, a very productive and fun few hours. Whitney Houston, of course. From the 1988 Olympics. Let the Games Begin! I often turn to Buddhism for assistance in dealing with anger, but this reflection by Steven Charleston offers a very helpful Christian perspective. Anger is a weight that keeps the soul from flying. It grounds us to walk the all too familiar paths of passion. We lose the ability to listen but wait impatiently to spring our next words like a trap. We feel the fire in the belly of blame and see through its heat only a distorted image of the truth we used to share. Anger seeks to control, to dominate, to demand. God save us from its dead power. God free us from its heavy hand. Let our souls regain their flight, light in spirit, open in mind, gentle in word and deed, that we may see and love more clearly in the clean air of your mercy. Given the fact that the outcome of the November presidential election is still very much up in the air, I am reviewing my alternatives should the Republican candidate win. My first option is to get used to hiding under the covers curled up in a fetal position. My second option is to learn well this song. If you think about media empires on topics domestic, the first name that comes to mind is, of course, Martha Stewart. But she’s not the only one. There’s Giada de Laurentes with her TV shows and her books. She is always appearing on magazine covers as well. Then there’s Rachel Ray, with her syndicated daytime TV show, her Food Network TV shows, cookbooks, and her magazine. To a lesser degree there’s Marcia Vallodid, with her show Mexican Made Easy on Food Network and her cookbooks. All three of these women convey a persona of a pleasant, likable person you’d love to have over to your house for dinner if you had a recipe that you felt good enough about. You’d enjoy spending the evening with any of them. Would I want to have Martha Stewart over for dinner? I don’t think so. I don’t hear from my old friend Larry very often these days, but this interview, which he sent out recently to friends, made me reflect on his singular life. I first met Larry when I was working at a small software company that sold a personal financial management product and which attempted, not terribly successfully, to position itself as a high-end product in relation to Quicken. He was a CPA in Petaluma in Sonoma County, and used our product in his practice. He liked to talk, a lot, about what he was up to, whether in relation to our product or not. The boss made me Larry’s primary contact, probably on the premise that it was better for my time to be wasted than his. I left that company, but Larry and I have remained in touch to a greater or lesser degree. Larry spent several years supporting the entertainment industry as a CPA before he gave up life in the fast lane for the rural west side of Petaluma. He came to love China, however, and attempted to set up a veterinary pharmaceutical business there. That failed. He was ripped off by the locals and overrun by the multinational pharmaceutical companies. His wife divorced him. He stayed in China. He set up a CPA practice there supporting American expatriates. He married a Chinese national and had a daughter with her. That daughter is now an adult. Today he splits his time between Guangzhou in Southern China and Hong Kong. He prepares expat tax returns. He writes books on taxes for expatriates and articles on a taxes, economics, and variety of topics. He speaks in public. And he follows American baseball via the Internet on his iPad. He freely admits to hating preparing tax returns, but he also knows that that is what pays the bills and allows him to write, speak, and listen to baseball. Larry is a marvelous example to me of how a person can handle adversity, remake one’s life, and turn it into one of happiness and contentment.